Offering accommodations as distinctive as its blue-themed design, Ocean Blue Resort goes to extremes in making its owners and their guests comfortable. With some of the most luxurious and large 4 and 5 bedroom accommodations as well as the best amenities, Ocean Blue meets that goal. Square footage ranges from 2100 to 2550 sq ft, and prices average from $450k to $550k. 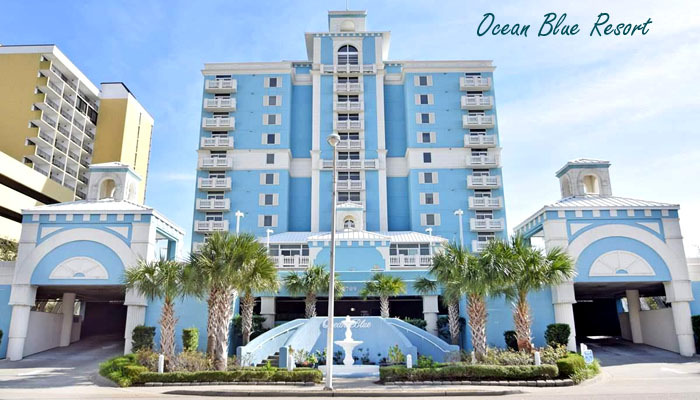 Located in the less-crowded far south section of Myrtle Beach, Ocean Blue is very close to Market Common and the Myrtle Beach International Airport. The Myrtle Beach State Park, Surfside Beach, and even the new Boardwalk are all convenient to this location. Amenities of these great Myrtle Beach condos include indoor and outdoor pools, a lazy river, and a great health club. Full kitchens and a separate dining area mean that there’s plenty of room to cook, dine and entertain. Units feature floor to ceiling windows, marble floors throughout, granite kitchen and bath countertops, stainless steel appliances, private balconies, and many extras that are specific to the unit. If you're looking for a large vacation home that will accommodate a family or group of friends, and you want only the best, by all means, take a look at the condos in Ocean Blue Resort. Call us for a tour of the available units.